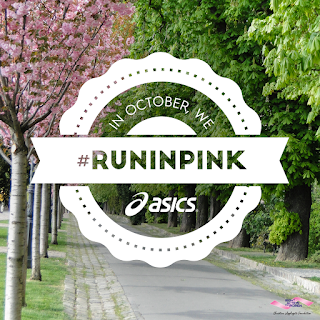 National Breast Cancer Awareness Month: Run in Pink with ASICS and win shoes! We've all had someone in our lives affected by breast cancer. My godmother has been diagnosed with stage 4 not once, not twice but three times and keeps fighting the battle. My best friends mother in law was diagnosed last year and is currently undergoing treatment. Women affected by breast cancer have one thing in common – they never stop running towards hope. 2. Tell ASICS why you chose to run in pink this month. 3. Follow ASICS America on Facebook, Twitter or Instagram - you just may see your pink photo on one of their accounts throughout the month of October! 4. Every Friday during the month of October, ASICS will give a lucky winner who posts with the #RunInPink hashtag a pair of shoes* from the Accelerate Hope collection, benefiting Right Action for Women. When you have run for breast cancer awareness, share the photo below to show that you are supporting the women around you who have fought hard for their health.